Today I am pleased to have a brief interview with fantasy author K. J. Parker, whose books include the Engineer trilogy, The Folding Knife, and The Hammer. 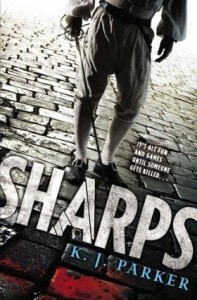 Sharps, K. J. Parker’s newest book, is out this week. Since I really enjoyed The Folding Knife, I was excited to have the opportunity to read Sharps a little early and ask the author a few questions about it. I also enjoyed Sharps because of the intelligent themes and well-written conversations and dialogue touched by a rather dark sense of humor (my review). Hope you enjoy the interview! Fantasy Cafe: Sharps is set in a world other than our own but does not have a lot of typical fantasy elements or magic. The same can be said for the other book of yours I have read, The Folding Knife. What draws you to writing these types of books and why do you choose to create your own world rather than writing historical fiction? K. J. Parker: If you write historical fiction, you’re horribly constrained by what actually happened. I’m not sure I could handle that; I’d want the Teutonic Knights to make mincemeat of Alexander Nevski and the Zulus to win at Ulundi, because the consequences would be so much more interesting to write about. I guess what I write is a sort of synthetic history; fiction made with history, the same way supermarket own-brand sausages are made with meat; just enough to make it taste right. I borrow heavily from history – names, aspects of cultures and civilizations, incidents from the lives of real people – but I need to be in control of the story, the driver rather than a passenger. FC: One thing that really impressed me about Sharps was the realistic setting with its cultures, politics, and religions. It’s definitely not the same as our world, yet it’s also not completely unfamiliar or difficult to grasp. How do you approach creating cultures, politics, and religions? What fundamental principles that you’ve observed do you keep in mind when developing these? KJP: There are two ways of doing fantasy; the WETA Workshops technique, or CGI. The CGI approach means you can have dragons, elves, any effect you want so long as it’s amazing to look at. The WETA Workshops approach, as exemplified in Peter Jackson’s Lord Of The Rings, is to have each prop, each cup, shoe, sword, stirrup-iron, handmade by craftsmen. The average movie-goer probably doesn’t consciously notice the stitching on the shoe or the way the light plays on the glaze of the hand-thrown plate; the effect is mostly subliminal, but it builds up to give an impression of authenticity, which in turn engenders belief, which is what the creator of fantasy would sell her grandmother to the dogmeat company to obtain. You don’t get belief with the CGI approach, which appeals to the imagination but has difficulty in getting the audience to sympathise and empathise with the characters. I guess it’s a question of what you want to achieve. In my case, give me D W Griffiths over Batman Returns any day. FC: You have quite a few books published, including both stand alone books and series. Where do you recommend readers new to your work begin? KJP: On the strict understanding that you’ll go back and buy the earlier ones (buy them; you don’t have to read them), start with the Engineer trilogy and then follow on chronologically.